Convert iTunes DRM protected audiobooks or Audible audiobooks in your iTunes Library to standard unprotected tracks, including MP3, AAC, M4A, AC3, AIFF, AU, FLAC, M4R and MKA with high quality. so you can use the unprotected tracks with players that do not supported DRM. Question: I recently updated my Mac OS to 10.14 Mojave. Since the update, the program is not working at all. Answer: AudioBook Converter 6.1.2 is fully compatible with macOS 10.14 or later. Please download the latest version of AudioBook Converter and reinstall it on your computer. Question: What operating system will it supports? Answer: Audiobook Converter will supports Mac OS X 10.8 and higher, perfectly compatible with the new macOS 10.14.4 Mojave. We will constantly updates to make it fully compatible with the latest iTunes and macOS Mojave. Question: What's the limit of the trial version? Answer: The trial version of AudioBook Converter for Mac can convert only 3 minutes for each audiobook while the full version has no such limit. Question: I keep getting an error message that says “iTunes is not running and needs to relaunch”? Answer: Please make sure that you are using the latest version 6.1.2, If not, please download the latest version of the software form our website and reinstall it. Question: Since updating to the latest version of iTunes, AudioBook Converter does not work, Is there an update for this? Answer: Yes, Please download the latest version of AudioBook to MP3 Converter for Mac and reinstall it. Question: Which kind of audiobook could be converted? Answer: All the audiobooks that could be played on your iTunes, could be converted by Audiobook to MP3 Converter, including audiobooks you bought from iTunes or Audible. Question: Why I can't select the audiobook to convert? Answer: Please make sure that the audiobooks is in your iTunes Library. and try to click Refresh first to ensure that the entire list are completely updated. Question: It takes an extremely long time to converting audiobooks, How to fix this ? Answer: The screensaver is the culprit! The solution is to go to System Preferences > Energy Saver, and then Adjust the computer sleep settings. Please set the screensaver to Never, and left the computer sleep at Never. and then try it again. Question: When open the program. The label ‘Loading iTunes Library tracks info, please wait…’ just stays there with the spinning indicator running. 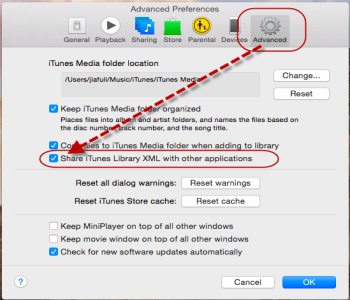 Answer: Go into iTunes Preferences, Advanced -> Check "Share iTunes Library XML with other applications" and then start AudioBook Converter again. Question: How can I get a technical support if I need help with my software? Answer: You can visit our website and look through FAQs to search for the answers or email us directly for help.